Haiku by Sharon Eisenhauer® was born and inspired from Sharon’s adoption of a little girl in Tokyo. With the growth of her daughter, Haiku by Sharon Eisenhauer® grew as well. The scope and direction of the company continued to adapt and evolve into beautifully crafted yet poetically functional collection of women’s bags. Haiku by Sharon Eisenhauer® is all about combining style with function. From the hippest, smallest, most compact, functional totes to the Ultimate Messenger with its adjustable strap and laptop sleeve, Haiku has the right bag for you. Feminine, flirty and functional these bags have it all. At Haiku by Sharon Eisenhauer®, they believe in being Karma Neutral™ which is offsetting anything negative that’s put into the world with something positive. Believing in balance, Haiku wants you to feel good about not only yourself but their bags. Haiku bags are just like Japanese poetry. Simple and concise with everything you need nothing you don’t, Haiku bags are it. Haiku by Sharon Eisenhauer - Small Tote Leaves (Wasabi (Green)) - Bags and Luggage JUST ARRIVED! A smart little tote bag, with a matte finished floral print. Holds your wallet, keys, sunglasses, lipstick and personal technology. Two exterior full size slip pockets. Interior lining with a back wall zip pocket and interior slip pocket; Contrast colored, dual shoulder straps. Shoulder drop: 10 length. Top zip closure. Dimensions: 10 wide x 11 high x 3.5 deep. Introducing the hippest, smallest, most compact, functional tote around! ; Adjustable strap - 28 to 54. Washable faux-leather pebbled suede - spills wipe right up. Moisture resistant cordura nylon. Quality brushed silver hardware. Signature Haiku stitching detail; like no other bag. Multiple interior pockets for organization. Slip pockets for cell phone and electronics. Internal zippered pockets. 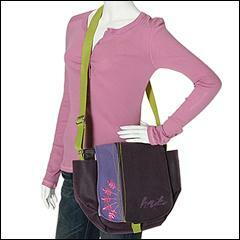 Exterior zippered pocket for easy access items. Dimensions: 10h x 12w x 3.5d. One look at this To-Go Bag and you'll never want to look away! ; It's the hippest, most compact, functional tote around! ; Adjustable strap: 28 to 54. Cordura nylon lining. Washable faux-leather pebbled suede. Gorgeous signature Haiku stitching detail. Dimensions: 10h x 12h x 3.5d. 7 pockets including: 2 water bottle pockets. 2 zip pockets. 2 MP3/Phone pockets. 1 hook-and-loop pocket. You are good to go for anything with this versatile and stylish bag! 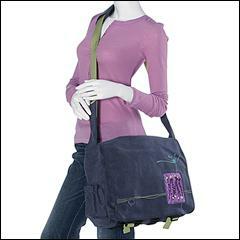 ; Features the unique applique and top stitching details found only on a Haiku bag. Spring clip for keys. Adjustable strap: 28 - 54. Dimensions: 12.75w x 11h x 3.75d. 7 pockets: 2 water bottle pockets. 2 zip pockets. 2 MP3/Phone pockets. One hook-and-loop pocket. Poetic function at its best. The Grab Bag is all you need for a quick getaway. 4 pockets: Secure front zip pocket. Exterior slip pocket. Zip coin pocket. Interior slip pocket. Large interior pocket for wallet, phone, etc. Hidden magnetic closure. Dimensions: 7 x 7 x 1.5. Looking for one tote to hold all your essentials and be as stylish as you? ; Look no further than this carry-all utility tote bag! 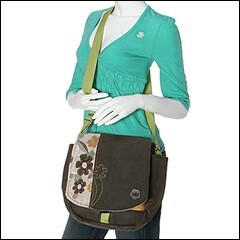 ; 2-in-1 tote handle and detachable shoulder strap with swivel hardware. Features the unique applique and top stitching details found only on a Haiku bag. Spring clip for keys. Zippered main compartment for anything and everything. Dimensions: 13.5w x 13.5 x 4.5d. 4 pockets: 2 exterior slip pockets. Interior zip pocket. Interior slip pocket. The Ultimate Messenger bag will carry daily essentials and keep you looking like a leader in style. Gorgeous embroidery and silk screen detail will keep this bag a favorite for years to come! ; Adjustable strap with an ergonomic shoulder pad. Rubber feet to protect the bottom. Spring clip to attach your keys. Washable pebbled faux-leather fabric with a sueded finish. Dimensions: 16w x 11h x 5.5 d - fits most 15 laptops. 7 Pockets Including: A padded pocket for a laptop. A large center compartment. 2 side pockets for water bottles. Zipper pocket for keys or a subway pass.